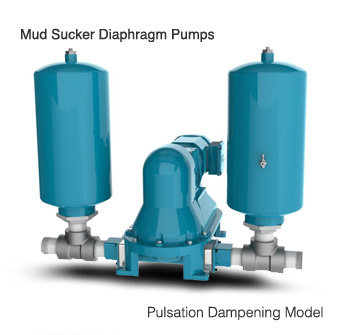 Josh, pulsation dampeners are a time tested solution for many continuous flow issues pump operators have. Wastecorp manufactures air chambers for every diaphragm pump model we sell. While we prefer to specify these with the pump at the design stage, there is no problem in sending these for contractor installation for the current set up. All we need are some photos of the existing application configuration and we can go from there. Positive displacement pumps by nature, generate a pulsating flow. When the ball flapper valve opens and closes, the momentum of the liquid reacts in the form of water hammer, which is absorbed by the hose or pipe. By installing a pulsation dampener, it will act as surge suppressor and reduce turbulence in the pipe. The increased volumetric expansion and absorption of the fluid results in a substation reduction of water hammer, as the below graph illustrates. For more information on pumps with surge suppressors, pulsations dampeners and air chambers visit wastecorp.com or call 1-888-829-2783.